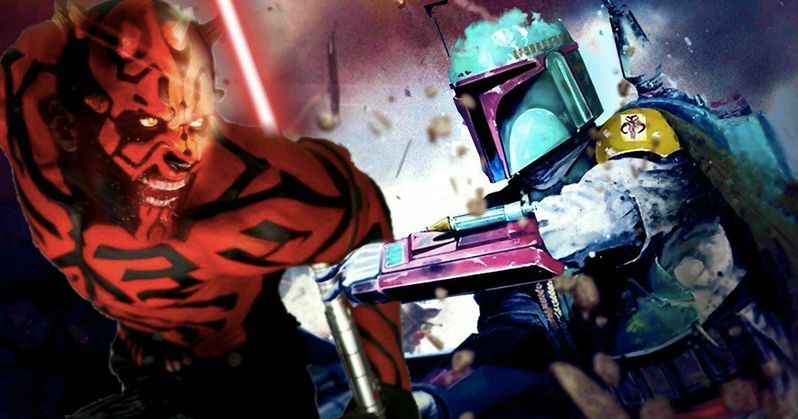 Could we see Darth Maul team-up with Boba Fett on the big screen in the future? That's ultimately for Disney and Lucasfilm to decide, but if Ray Park has his way, this is something that would definitely happen. Park recently, albeit briefly, got to reprise his role as the former sith in Solo and that's help put the desire to see more of the character out in the universe. So, why not team him up with the legendary bounty hunter in a future Star Wars movie? Ray Park showed up at the tail end of Solo as Maul, which came as a major surprise to fans, as the character had been cut in half by Obi-Wan Kenobi at the end of The Phantom Menace and hadn't been seen on the big screen since. But as the movie demonstrates, the character not only survived, but ascended to the top of a criminal organization known as Crimson Dawn, which played a major part in Solo. Speaking in a recent interview, Park indicated that he would love to see this storyline continue, with actor Daniel Logan, who portrayed Boba Fett in the prequels, suiting back up to aid Maul in a new movie. Here's what Park had to say about it. "I hope so. It would be cool. For many years, when Daniel was coming over before Solo, I said, you never know, one day they may do something. Daniel is one of these guys who's Mr. Natural. He doesn't actually have to work at doing anything, he can just do it. So with some work, he could be unbelievable." Daniel Logan and Ray Park spent many years training with one another, so there's a familiarity there. Before digging into the practicalities of whether or not this could happen, from a business perspective, let's talk about story. Crimson Dawn's introduction in Solo opened up a world of possibilities on that front. Why couldn't Maul recruit Boba Fett to help the criminal organization out with some seedy business? Fett is a gun for hire, and a good one at that. No question, there is a way to make this work. Now, as for the matter of Lucasfilm giving something like this the go-ahead? That seems far less likely. Solo, by many measures, was kind of a disaster. The production was a mess, with the movie essentially have to be shot twice, which inflated the budget. And the box office was lackluster, with the movie bringing in less than $400 million worldwide. For a Star Wars movie, that's poor. This derailed any chances of a sequel and, quite possibly, further standalone movies in a galaxy far, far away, such as the long-rumored Obi-Wan movie. There were also plans for James Mangold to write and direct a Boba Fett standalone, but we haven't heard any official updates on that front. But Darth Maul, thanks in part to The Clone Wars and Rebels animated shows and in major part thanks to that Solo cameo, is as popular as ever. It would seem silly to not do more with him in live-action while they can. Whether or not that happens, and whether or not that includes Boba Fett, is another question entirely. Fans and Ray Park can continue to hold out hope for the time being. This was originally reported by Nerdist.